Easy iPod Transfer Software. Sync iPod with computer. Syncios iPod Transfer Software can transfer music, playlists, video, photos, apps and games from an iPod to your PC, synchronize your iPod with any desired computer and transfer iPod contents between iPod and PC effectively. This free iPod Transfer includes everything you need to backup, upload, copy, save, transfer, and move iPod contents to PC, computer or other hard drive. It also gets the function to put those contents from your PC back onto any iPod or share with other Apple device. 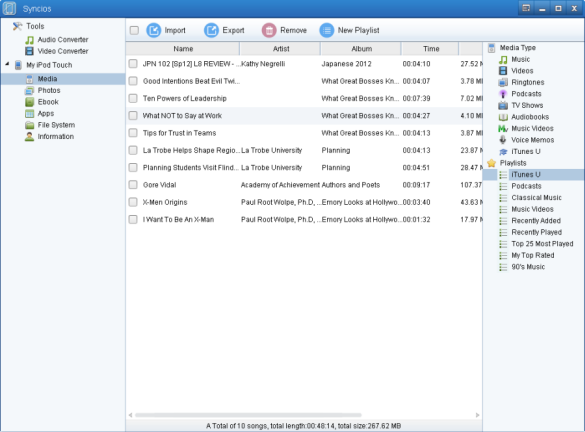 With Syncios iPod Transfer software, you are now free from ineffective management of your iTunes library. Transferring music or videos from PCs to iPods, iPods to PCs, iPod to iPod, iPod to iPad, iPod to iPhone is no longer unreachable. It can solve the tough problem of one-direction synchronization and make iPod contents management and transferring much more easier. Quickly and easily copy your music and video from any iPod back onto any Windows computer. You can also copy tunes and movies from your PC onto any iPod. The iPod Transfer Software move your music and video seamlessly between computers and iPods. Add movie, TV show, eBook, music and more from PC to your iPod, delete unwanted file to spare space for new files. One click to export files to local hard drive. The built-in virtual file system allows you to access any folder in iPod. You can use iPod as USB key to keep import file with you. Fully support iPod Touch, iPod classic, iPod Nano and all iPod models, even compatible with iPhone and iPad. 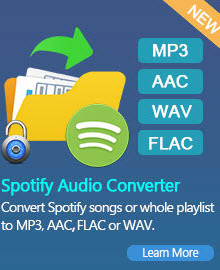 Syncios iPod Transfer also features the functions as free audio converter & free video converter. 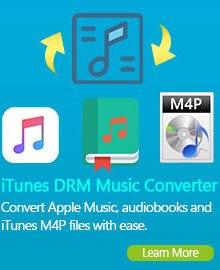 It supports converting a vast range of audios/videos to MP4, MOV, M4V, MP3, M4A, M4R and CAF for iPod/iPad/iPhone. 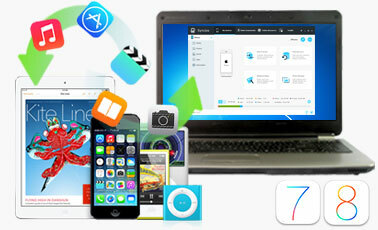 Syncios iPod Transfer allows you to manage and backup the information on iPod/iPad/iPhone freely. You can also remove or reconver your contacts with this Syncios iPod Manager. Backup or add new contact, manage bookmarks, notes, voice memos are also available. If you have more than two computers and want to share music/movie on iPod with multiple computers, if you need to transfer iPod contents to different computers, or you ever thought of backing up your iPod contents, we highly recommend you try out this free iPod transfer software. Syncios iPod Transfer can be a great iPod to PC transfer, music to iPod transfer, movie to iPod transfer and moves your music and video seamlessly between computers and iPod!